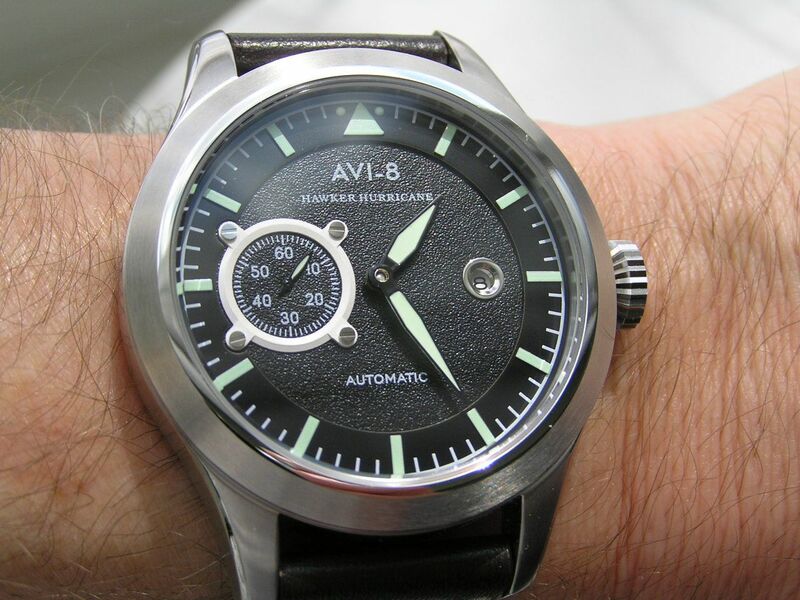 When a representative from the AVI-8 watch company contacted me about doing a review on one of their watches, I was quite excited. What’s this? A watch company that has a wide range of nifty looking watches that I have never heard of? Great, bring it on! 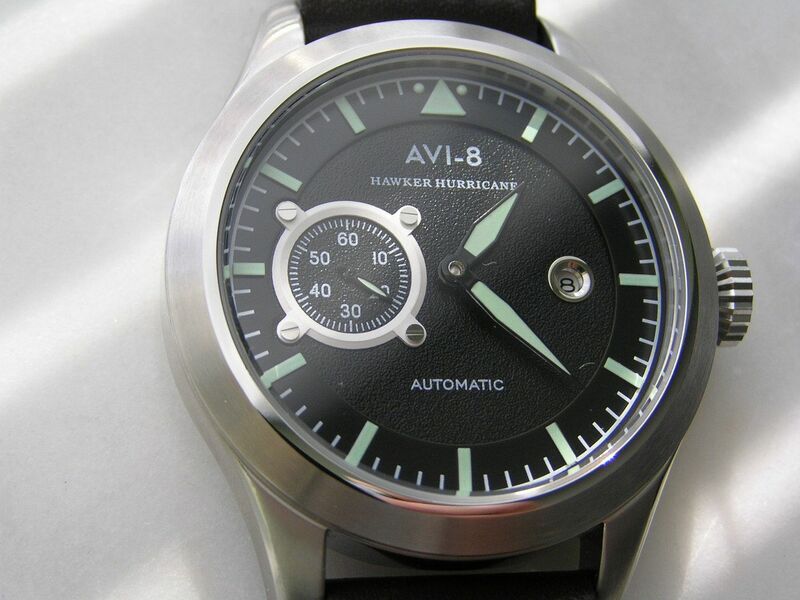 AVI-8 is a British company that sells a lot of their watches in the UK, but also has distribution in the U.S. Their watches can also be found at a considerable discount off MSRP at Amazon. 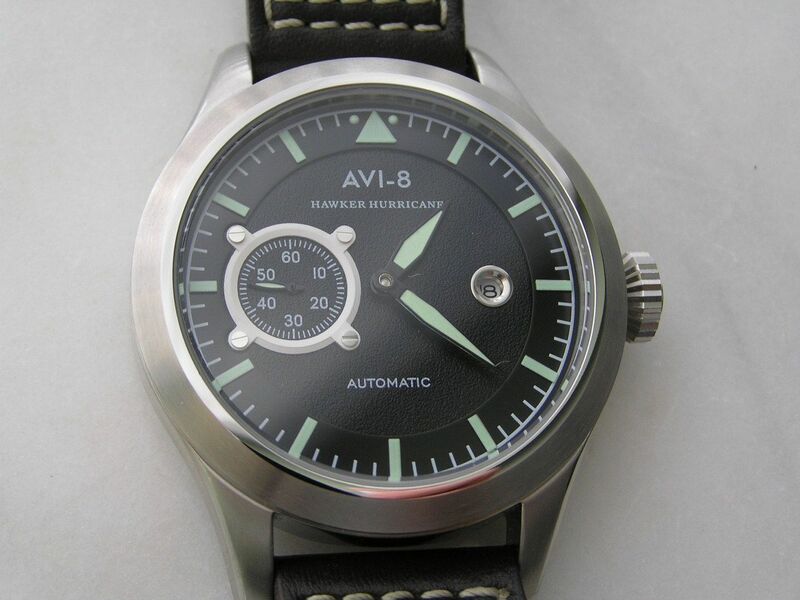 The AVI-8 web site is well done, the range of pilot watches and chronographs they produce is impressive, with styles that are their own; there aren’t really any homage-type pieces in their collection, which is refreshing. 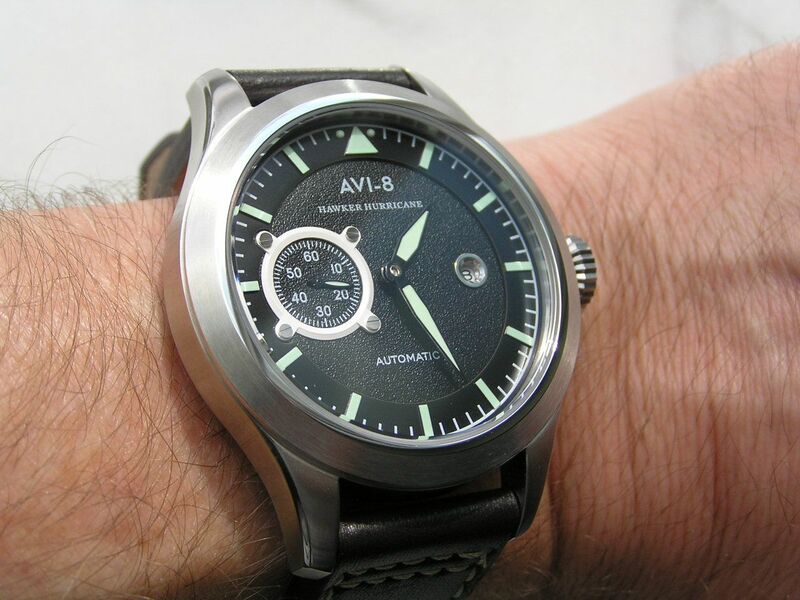 They make both quartz and automatic watches and I was interested in reviewing one of their popular Hawker Hurricane automatics. This model is named after the Hawker Hurricane airplane, which was the first monoplane fighter to enter service into the Royal Airforce (RAF) in Britain according to an information card included with the watch. Powered by a Rolls Royce engine, the Hurricane was the first RAF fighter to exceed 300 mph. 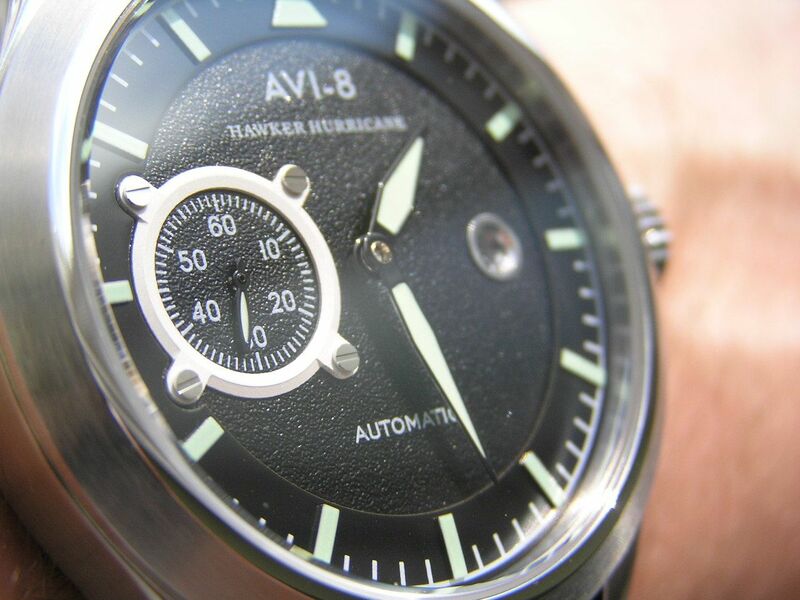 While the AVI-8 Hawker Hurricane watch doesn’t go 300 mph, it does hold its own on your wrist. Starting with a brushed stainless steel case that measures a healthy 46mm without the large knurled crown, the Hawker Hurricane does make a statement when worn. The big crown enables easy setting and winding and is embossed with the AVI-8 bulls eye logo. 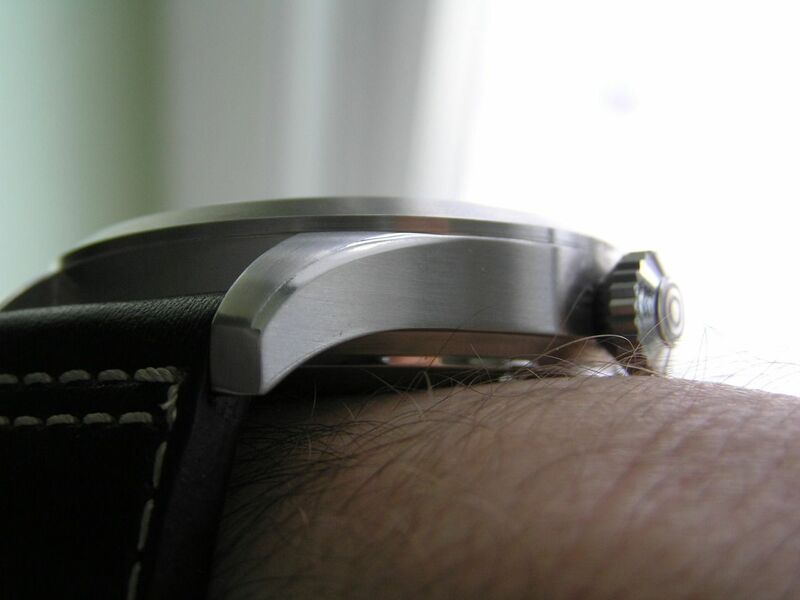 The caseback is a screw down display type with a polished stainless steel outer edge. The movement is really nothing special to look at; it’s undecorated and the rotor is not signed or stylized in any way, so what’s the point of putting a display back on this watch? 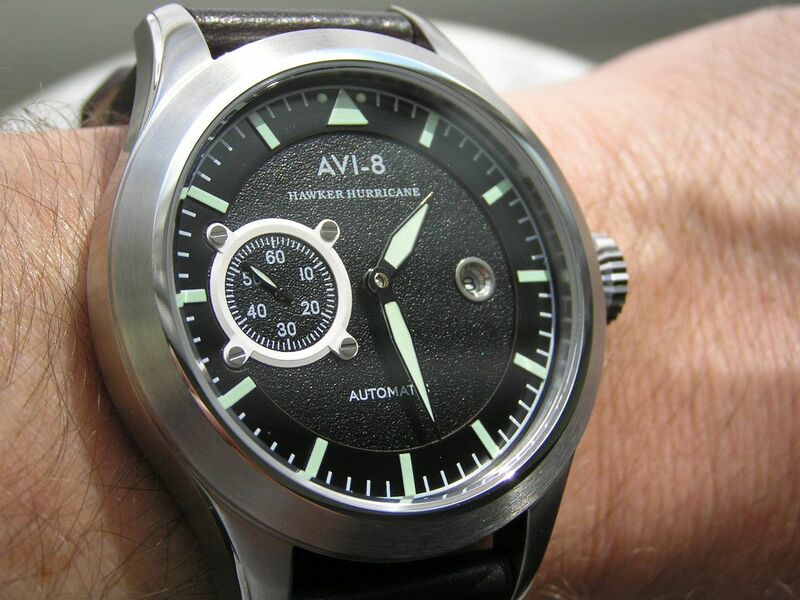 It would be much nicer if AVI-8 installed a solid caseback instead, emblazoned with a graphic of a Hawker Hurricane fighter. 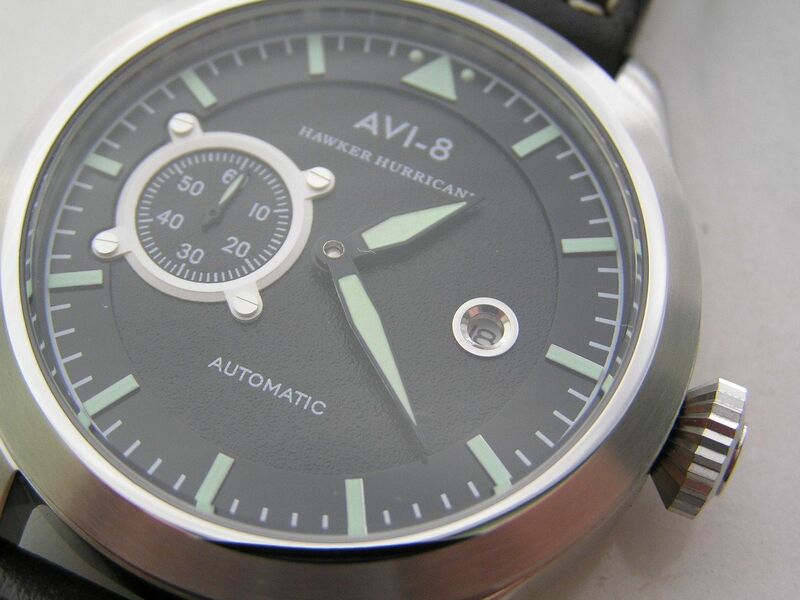 The Hawker Hurricane pilot automatic is factory rated for a modest 50 meters of water resistance. Overall fit and finish on this piece is good, with no unduly sharp edges on the case or dirt or other discrepancies noted on the dial under an 8X loupe exam. One of the plates on the movement had some discoloration or smudging on it, but it didn’t affect the movement’s performance. The dial is quite interesting on this watch. The field of the dial has a textured, slightly pebbly black finish with an overlayed chapter ring that has the luminous minute and hour markers on it, with a luminous triangle with a dot on either side located at the 12 position. At the 3 position is a rather small round date window ringed in silver. The date window is a tad bit too small, as it almost obscures part of the date wheel, especially when the date is in double digits. A larger date window is required here. The date wheel itself is black on white and alignment within the small porthole is good. Quickset date action through the crown works fine. 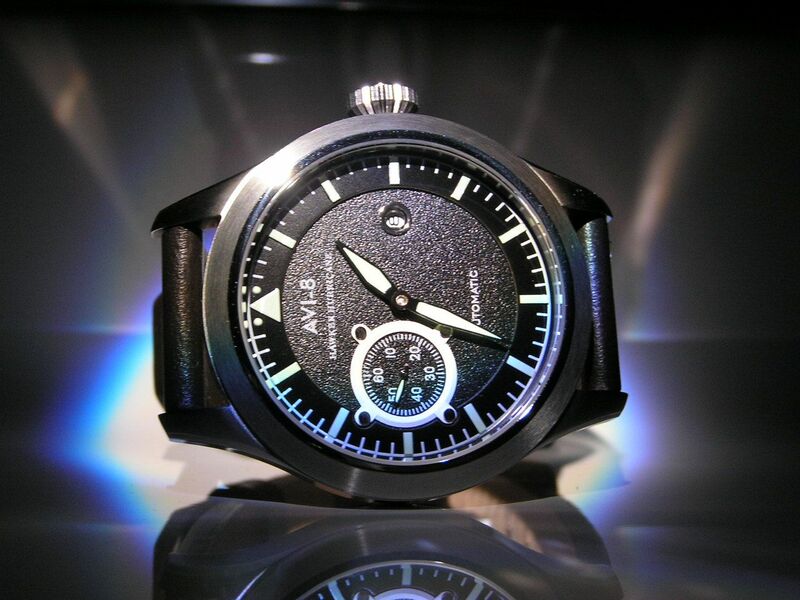 The hour and minute hands are semi-sword style and are black with inset lume. 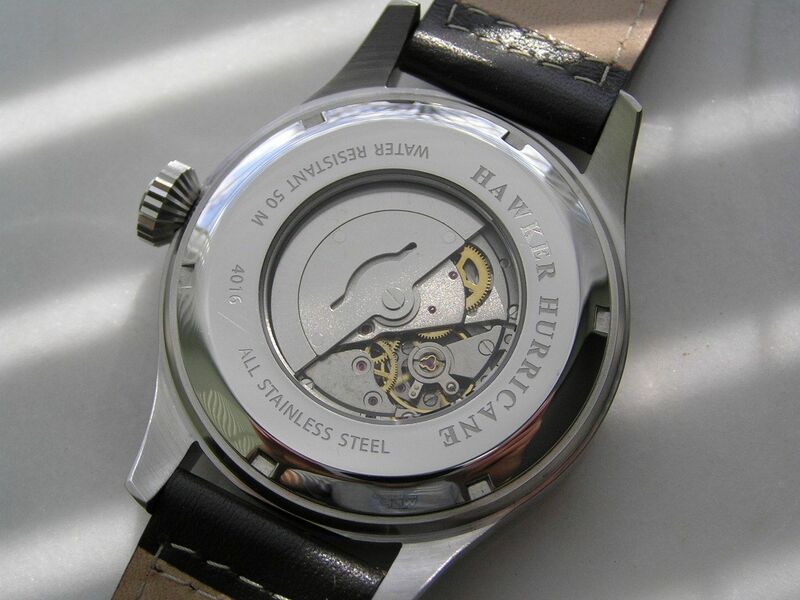 The seconds subdial located at the 9 position (making this watch in popular parlance a ‘nine-eater’) is surrounded by a screwed down silver frame, adding a bit of flair to the dial. 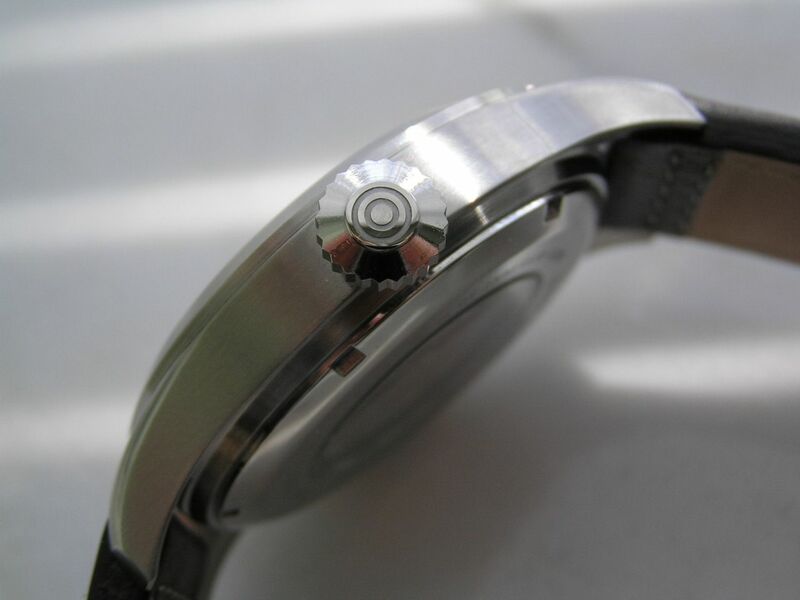 The subseconds dial has small arabics every 10 minutes, with hash marks for the rest of the dial. The seconds hand is black with inset lume. 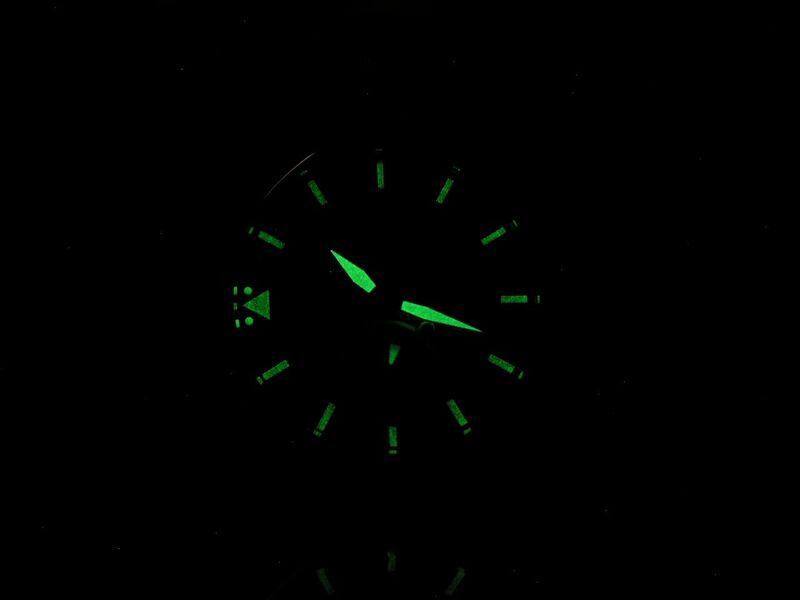 All the lume on this watch is green colored in normal light, which at first I wasn’t too crazy about. 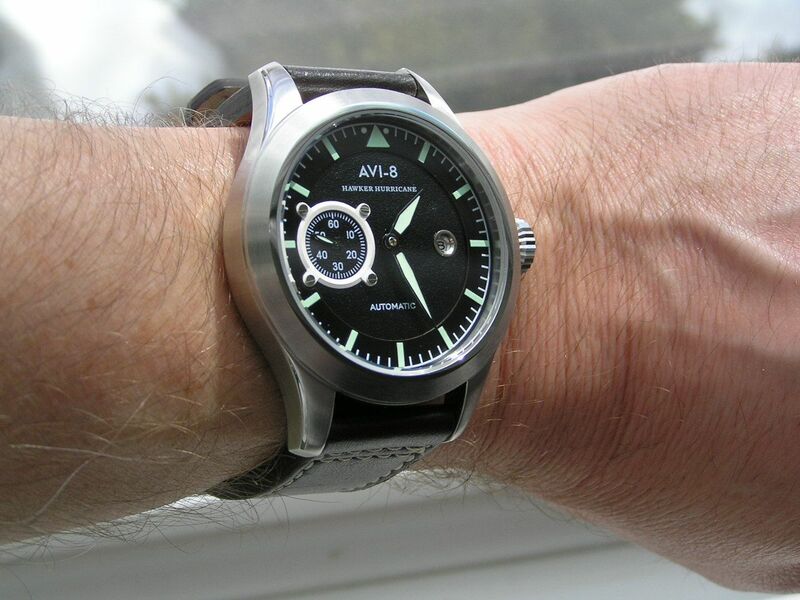 I like lume on a watch, but sometimes if it’s too greenish in daylight, it detracts from the overall look of the piece. I’ve grown accustomed to the green lume on the Hawker Hurricane and in the dark, the lume quality is acceptable. 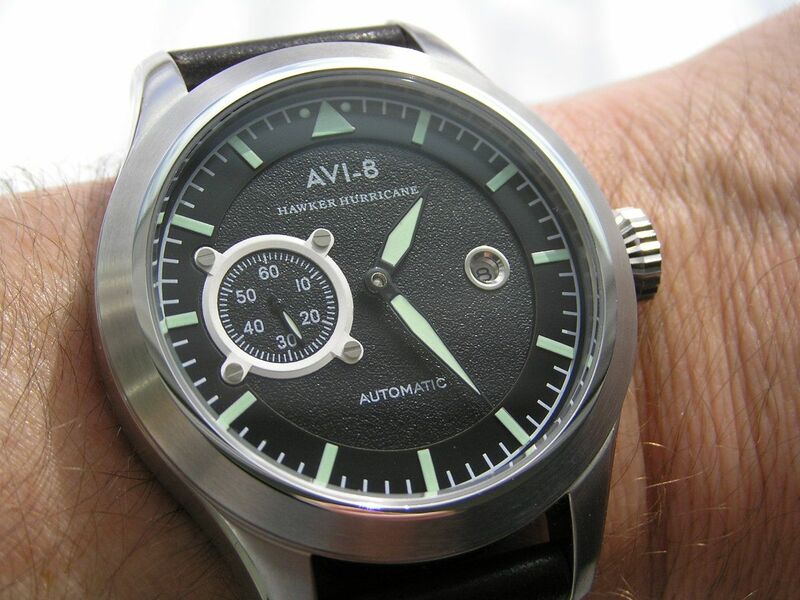 The rest of the dial is nice and clean, with ‘AVI-8’ and ‘Hawker Hurricane’ under the 12 position and ‘automatic’ above the 6 position. The balance of the dial is slightly off-kilter due to the large subseconds dial on the left and the small date window on the right, but it’s not a major distraction and actually helps give this watch its own sense of style. Capping the dial is a flat mineral crystal set perfectly into the case, with no distortion or defects noted. Inside the Hawker Hurricane is a Chinese automatic movement, a DG-3809-3D, which AVI-8 tells me is a ‘modified Seagull movement.’ Beating at 21,600 bph, the movement hacks and manually winds. Setting, winding and overall operation of the movement has been fine. Accuracy has averaged about +10 seconds/24 hours (even better on the wrist), which is completely acceptable for this movement type. Power reserve is a very fine 49 hours. I still have reservations on the long-term durability and reliability of Chinese-made automatic movements, but so far, the one in this Hawker Hurricane has acquitted itself quite well. 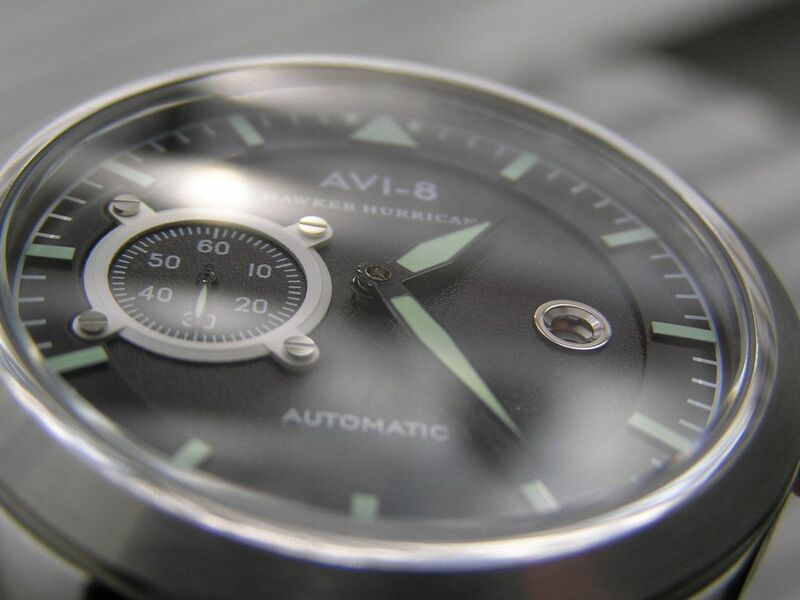 One pleasant surprise with the AVI-8 Hawker Hurricane is the quality of the leather strap that comes on the watch. It’s a smooth dark brown leather with white contrast stitching, not really padded, but quite thick. Many times thick straps are too unwieldy, but this one has enough give to make it properly hug your wrist, even with the large size of the watch itself. 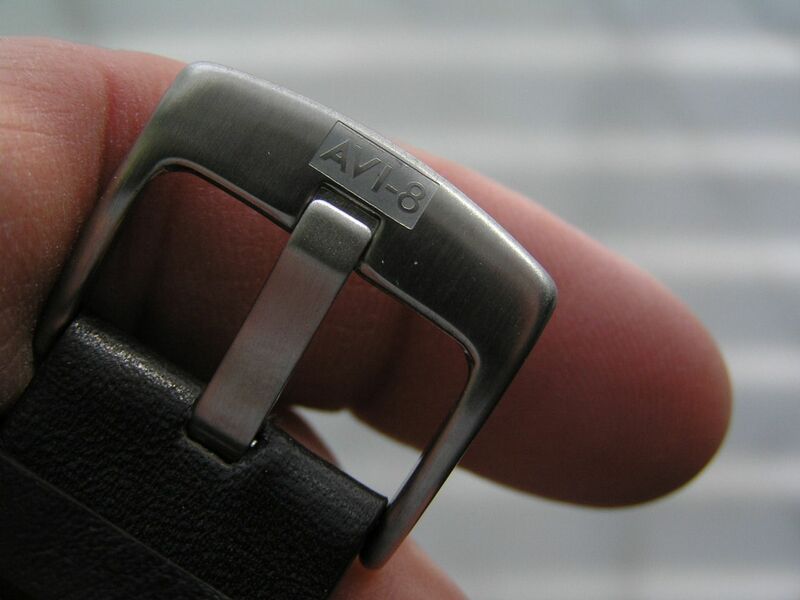 The strap is signed on the inside and has a brushed stainless steel buckle signed with the AVI-8 name. Two keepers, one fixed and one floating keep everything in check. 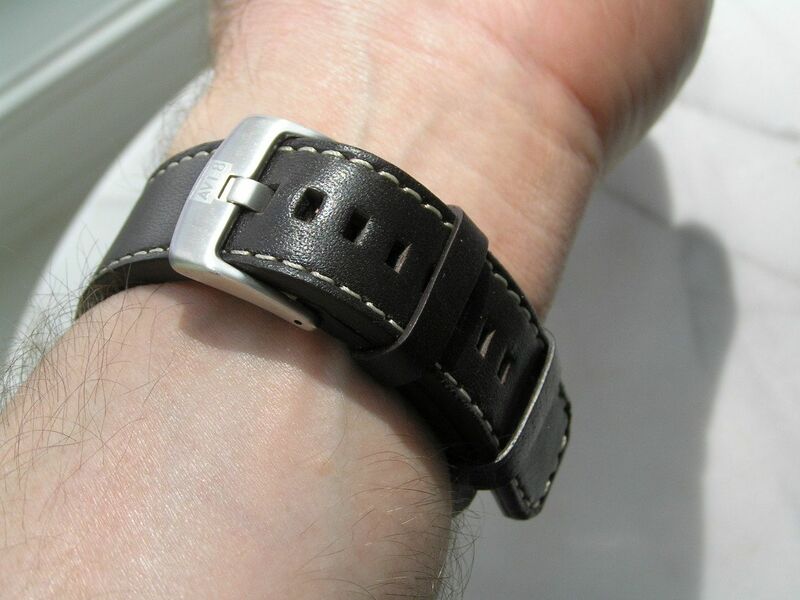 The strap measures 22mm at the lugs and tapers slightly to about 21mm at the buckle. 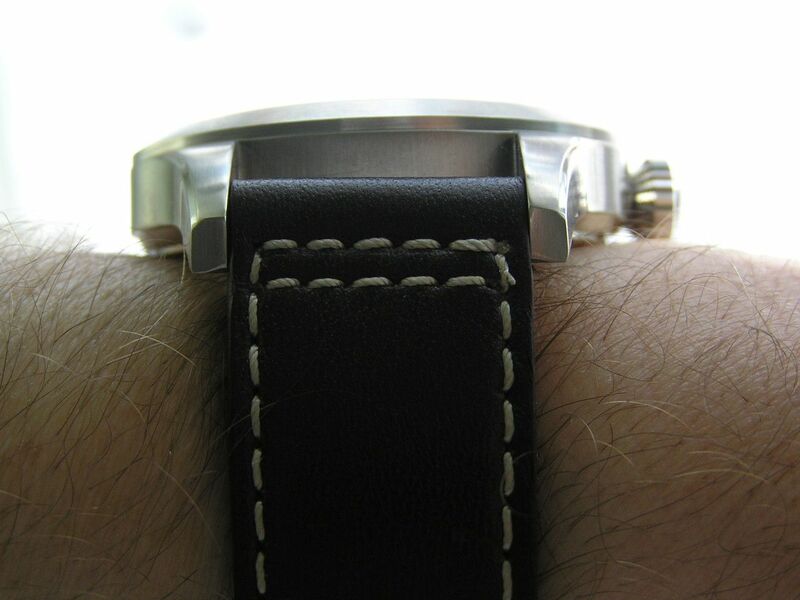 The end of the strap is squared off with rounded edges, which is a nice touch. The strap also doesn’t have any offensive odors to it. Sometimes, cheaper leather straps smell like a wet dog, but this strap is a quality piece that compliments the watch well. Presentation is another strong point with the Hawker Hurricane. 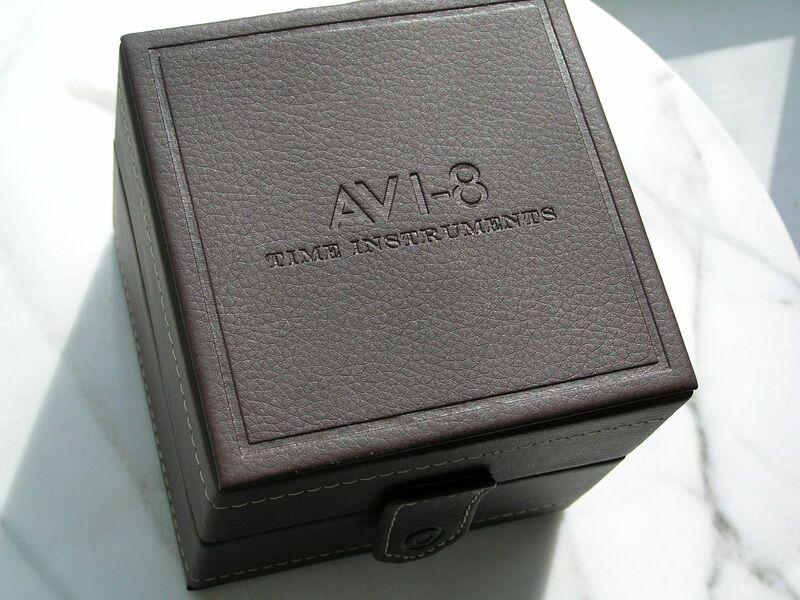 A white cardboard outer box with a brown padded and stitched leather-like inner box with a snap tab closure contains the watch. 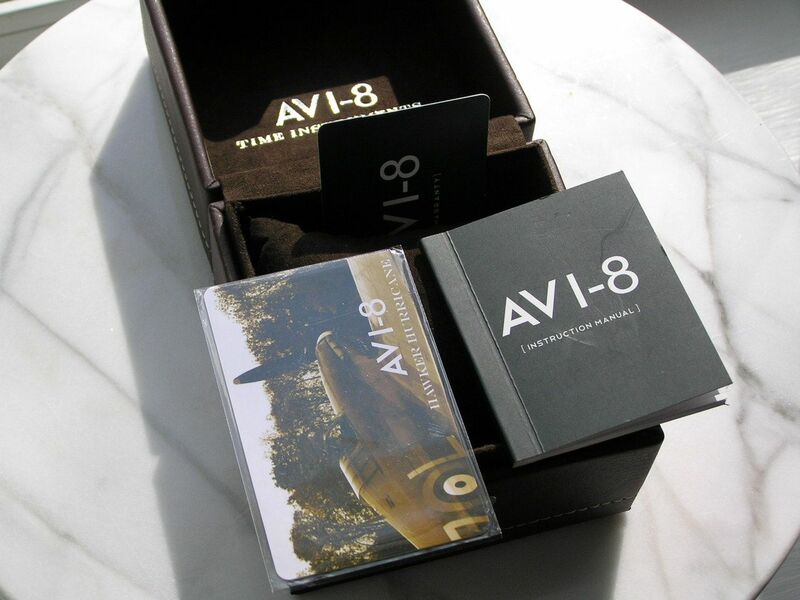 Inside this padded box is the watch, hang tag, watch pillow, instruction manual, warranty card (a two-year warranty is standard) and the Hawker Hurricane info. card mentioned earlier. The way the box is designed, the top half lays practically flat when opened, so you could use it as a small jewelry box or watch holder on a dresser top if desired. At last, a watch box that can be used for something useful instead of being relegated to a dark closet shelf. 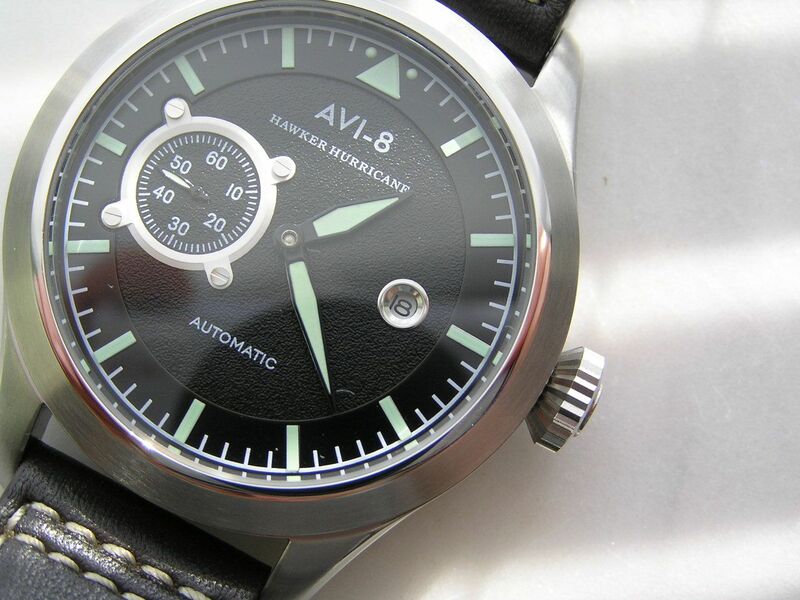 Overall, the AVI-8 Hawker Hurricane is a smartly styled affordable (when bought at a discount) pilot watch that certainly has its own unique look. It wears surprisingly well for its size and has enough flair to keep up in today’s frenetic world. 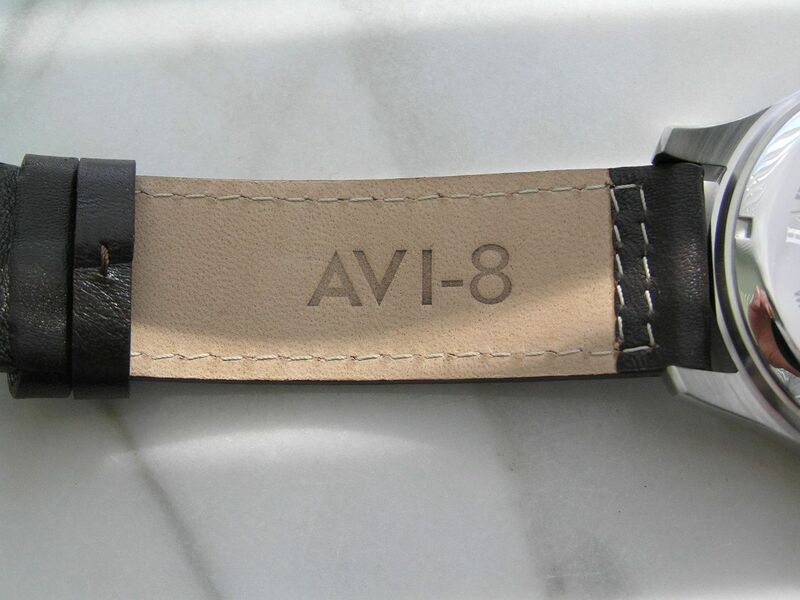 Props to AVI-8 (pun intended?) for coming up with watches that have interesting designs, good quality and nice features in the crowded watch world. 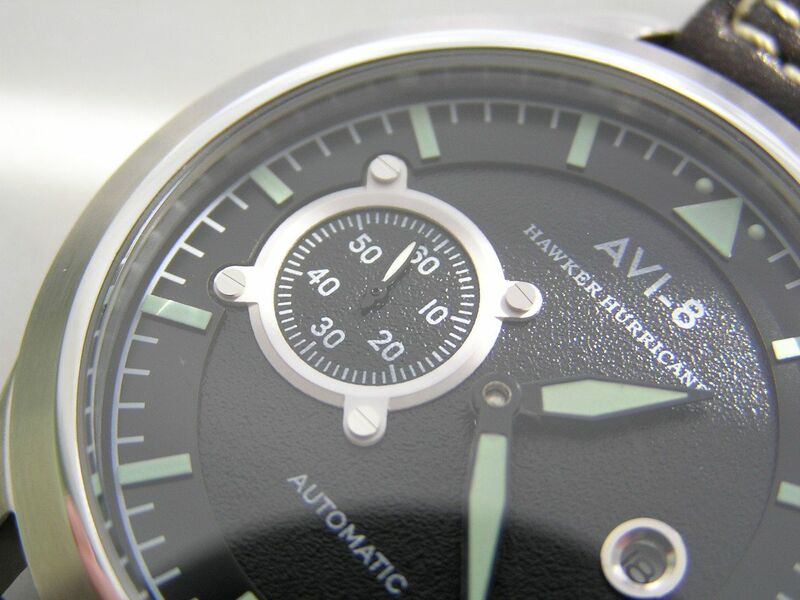 Verdict: stylish and bold but not brash, this Hawker Hurricane automatic pilot watch shows that AVI-8 is serious about bringing an affordable alternative to the crowded field of ‘me-too’ homage watches and other look-alikes. Cheers! to the company for making a pilot watch that stands on its own. I had never heard of this brand until today. Nice review and I agree with you on the pros and cons. At 50mm is it large unless you like to wear a saucer on your wrist. This manufacturer has many other models that meet the suggestions given in this review. The designs are very aesthetic and quality is very reasonable. They look more expensive than they really are.